The seating surfaces we face on a daily basis are often not comfortable. One of our main complaints involves the point of contact where our body weight exerts pressure on the seat of a chair. This often leads to discomfort and fatigue. The GSeat uses visco-elastic gel and a functional design to disperse pressure and improve the level of comfort wherever you sit. Center relief groove eliminates soft tissue compression and suspends the tailbone (coccyx) , which eliminates direct pressure on the spine. The GSeat incorporates the premier material in gel technology, which maintains its shape and cushioning properties better than any polymers and foams currently on the market. It provides relief from the stressful affects of being seated for long periods of time, like low back pain, stiffness and numbness in the lower legs. The most innovative development of the GSeat is an integrated handle that folds the seat in half when you carry it making the GSeat conveniently portable. There is no other product like it! Because of superior materials and functional design, we feel that GSeat is the premier portable product for seated comfort. We think you will too. Ideal for use in church pews, car seats, picnic benchs, stadium seating, concerts, sitting on the ground, camping, internet cafes, coffee houses, etc. 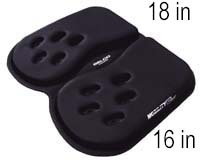 Helps prevent pressure sores in diabetics of those confined to a chair or wheelchair. The new GSeat is 16" wide and 13.5" deep. Please note that the Gseat is formed with an anterior (forward) tilt or seat wedge like design. This requires that it be properly placed with the thinner side forward, in order to get the true benefit that can be derived. This facilitates an ergonomic forward pelvic tilt that helps the hip joint, improves the posture of the spine and can aid with sciatica. Ergonomically engineered to enhance comfort while seated. It slopes forward 5 degrees to return your pelvis to its proper posture, reducing low back pain and maintaining proper lumbar curvature. The Gseat Ultra is a plush 2 inches thick in the main seating area toward the back. It uses polyurethane gel to disperse pressure at the point of contact, while also featurning a center relieved groove that eliminates pressure on the the tailbone and soft tissue. Dynamic Density Technology combines the benefits of a generous portion of gel and memory foam to create a medium weight cushion that provides superior comfort (about 4.5 lbs). The Gseat Ultra is quite a bit larger than the regular Gseat and requires a little larger seating surface, but if you have the room, the comfort of this one is unbeatable. The Integrated Handle and foldable design is patented technology that makes the Ultra Gseat conveniently portable.